Looking for a place to relax and get away? The Heritage House is the perfect spot! Tucked away in the hills of Brown County, this renovated two-story farmhouse is completely furnished with all the comforts of the 21st century. 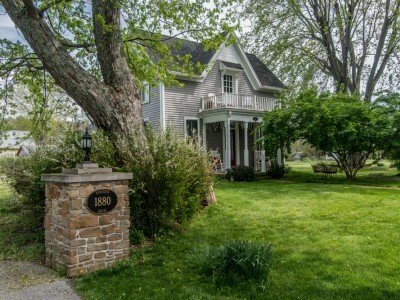 The Heritage House is located on a quiet dead end road, two miles from Nashville, the "Art Colony of the Midwest", only moments away from an abundance of fine dining, shopping, live music and theatre, surrounded by the sounds of nature and a picturesque landscape. The Heritage House provides a relaxing experience you'll not soon forget. Pack your bags and head to a place where inspiration awaits! This lovely farmhouse is completely furnished and provided with all the comforts of home, including DVD and VCR players. The main floor offers one bedroom, bath with shower, kitchen, living room, and a separate dining room. The bedroom comes with a queen pillow topped bed with luxurious bedding. In this first floor space is a fully furnished kitchen with stainless steel appliances and dining room that seats six. The inviting living area provides a warm and snug environment. On the old-fashioned front porch there are two rockers in which to relax and watch the sun go down. The upstairs floor is equipped with two bedrooms, bath with shower, kitchen, dining room, and living room. Both bedrooms come with pillow topped mattresses and upscale bedding. There is a completely furnished kitchen and cozy breakfast nook that seats four. The spacious living area provides for a relaxing atmosphere in which you and your friends can gather. A deck off the living room allows you to view the stars at night and there is a 6 person hot tub to enjoy. Linens and basic needs are provided as well as kitchen utensils should you decide to do some cooking while you are here. Access to charcoal grills are also available for guest use upon request. Coffee and tea are in the cupboard along with some sugar and creamer. Remotes for the TV's are placed on the sides of the TV's.